Fueling the shift, NPD expects the average selling price of tablets to fall slightly —from $311 in 2014 to $296 in 2017 —as economies of scale make display production less costly and manufacturers move to smaller tablet sizes. Traditional PC makers will be forced to follow the trend, NPD believes, leading to even more savings for consumers thanks to increased competition. 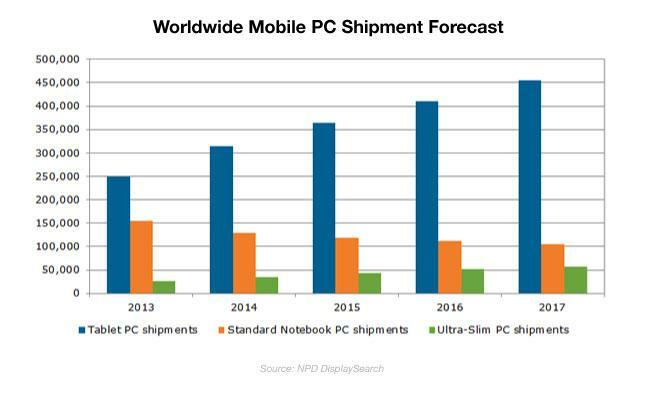 Much of the growth is expected to be driven by emerging markets, which NPD predicts will account for more than 60 percent of mobile PC shipments by 2017. Those regions overwhelmingly prefer the tablet form factor already —traditional notebooks book just 30 percent of sales, with tablets taking the remainder.